Have you read in the New Testament about when the 3 Wisemen brought Frankincense and Myrrh to the baby Jesus? I've always thought of them both as being super expensive and very extravagant. They were both used as components in the holy incense that was burned in sacred temples during ancient times, according to the Hebrew Bible. 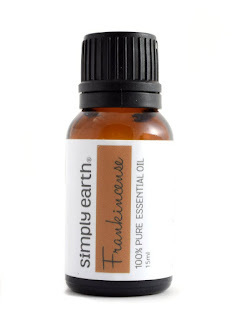 I recently received a bottle of Simply Earth Frankincense Essential Oil to try out, and as usual did a little research to find out what uses Frankincense Essential Oil has. I was so surprised how many things it's good for. Maybe that's why in ancient times it was such an extravagant gift. In most cases you mix 50/50 with an unscented carrier oil and apply where it's needed. For arthritis pain and swelling of the joints just massage the 50/50 mixture to the joints before bed and during the day. It helps relieve the pain of a gout flare up too. It's great for just about anything with your skin, whether it's a rash or wrinkles. Just a drop of Frankincense Essential Oil can be applied to cystic acne and in just a few applications it will clear up. It's also great for colds and congestion, just put up to 6 drops in a sink or bowl with hot, not boiling water. Drape a towel over your head to trap the steam and breathe in the vapors for at least 5 minutes. It can be used in a diffuser to give a calming relaxed atmosphere. It has a spicy, warm woodsy scent. Can also be applied to the back of the neck to relieve anxiety and depression. I will be keeping Simply Earth Frankincense Essential Oil on hand now that I know all the things it can be used for. I received this product for free in exchange for an honest unbiased review.